Msgr. 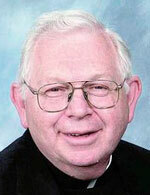 John B. Wendrychowicz, 65, pastor of St. Agnes Parish in Sellersville, died Dec. 20. Born in Philadelphia, the son of the late John B. and Rita (Shepherd) Wendrychowicz, he attended Visitation B.V.M. School, St. George School and Northeast Catholic High School, which he left during his sophomore year, to enter St. Charles Borromeo Seminary. He was ordained May 10, 1973 at the Cathedral of SS. Peter and Paul by Cardinal John Krol. His assignments were as parochial vicar at St. Ladislaus, St. Josaphat and St. John Cantius Parishes, all in Philadelphia, and St. Katharine Drexel Parish in Chester. He also served on the faculty of Archbishop Kennedy High School and St. Hubert High School and as chaplain of Little Flower High School and Cardinal Dougherty High School. He was pastor of St. Ladislaus Parish in Philadelphia and since 2006, St. Agnes Parish. Since 1992 Msgr. Wendrychowicz served as archdiocesan director and chaplain for the Catholic Committee on Scouting and also as Region III (Pennsylvania and New Jersey) Chaplain, National Catholic Committee on Scouting. Rita Raddatz, Msgr. Wendrychowicz’s sister, remembers her brother as a man who loved life and loved people. “He did so much for so many,” she said. He loved travel, visited many Indian reservations and was a history buff who served as a costumed re-enactor in a Philadelphia celebration of the signing of the Declaration of Independence, she recalls. He was a fan of “Star Wars,” “The Chronicles of Narnia” and the Harry Potter series of movies, and had wanted to see “The Hobbit” film before he died. He also enjoyed Disneyland, where he would try to get his friends to go on all the rides. He especially enjoyed the Christmas liturgy for children, his sister said, where he might weave in lessons from the “Polar Express” into his homily. Msgr. Wendrychowicz’s funeral Mass was celebrated at St. Agnes Church on Dec. 27, with Saginaw (Mich.) Bishop Joseph R. Cistone as principal celebrant and homilist. Concelebrants included Msgr. Richard J. Skelly and Fathers John F. Babowitch, Michael S. Olivere and Michael J. Reilly. Msgr. Wendrychowicz is survived by his brothers, David (Anna Marie) and Joseph (Pamela); his sister, Rita (Curt Raddatz) and nieces and nephews. Interment was at Calvary Cemetery, West Conshohocken.